Scars are caused by skin trauma, either as a result of acne, a surgical procedure, or an unlucky accident or burn. Depending on how deep the injury was and the type of skin you have, scars can be either permanent or self-resolving. Facial scars can be particularly problematic as they are more visible to the naked eye. Fortunately for us, advancements in scar therapy has gone far beyond a watch-and-wait approach. 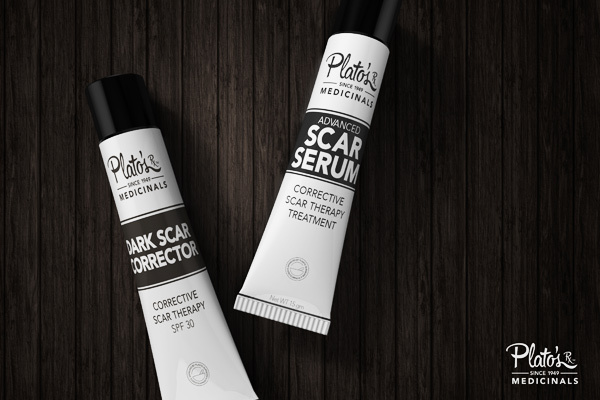 Products like Plato’s™ Medicinals Scar Serum and Plato’s™ Medicinals Dark Scar Corrector can address the most common types of scars on the face. Our experts weigh in on choosing the right product for the right scar. A process known as post-inflammatory hyperpigmentation (PIH) is the main culprit behind those annoying dark marks left behind after a pimple goes away. The darker your skin complexion, the more risk you have for developing PIH acne scars. A raindrop sized amount of Plato’s™ Medicinals Dark Scar Corrector can help reduce pigmentation and dark scars on the face, while simultaneously preventing sun-induced skin discoloration with four active sunscreens. Similar to the process of dark scars, red scars are often caused by a process known as post-inflammatory erythema (PIE); which is caused by a heightened response of the skin to pimple inflammation. Red scars can last a very long time and can resolve quicker after application of Plato’s™ Medicinals Scar Serum. Plato’s™ Scar Serum contains a mix of polysiloxanes that have been shown to slow the process of scar formation. Scars that develop after a cut in the skin can become thicker and wider with time. Noticeable changes in scar thickness and height can lead to a visible scar that changes with time. Experts agree that a medical-grade silicone gel such as Plato’s™ Scar Serum applied twice daily can help control abnormal scar formation and decrease the visibility of a scar. Expert plastic surgeon and scar guru Dr. Raffy Karamanoukian in Beverly Hills, California advises patients to seek early treatment for scars to avoid scar visibility. “Always protect scars from direct or indirect sun exposure and seek a qualified surgeon who understands the fundamentals of scar prevention and treatment,” he adds. This post is in partnership with Plato's Dark Scar Corrector. Thank you for supporting posts that keep Style for Mankind running!